Bordered by Kedah and Perak, Penang is the 2nd smallest state in Peninsular Malaysia. Penang is divided into 2 parts, Penang Island and the mainland, Georgetown is the capital of the state. Penang is a very well developed state as well as a popular travel destination for locals and tourists from around the world. The people of Penang are commonly known as Penangite and there are lots to discover here in this state for its ethnicity, culture, language, religion and of course a variety of good food as well. Transfer Road Roti Canai at Jalan Transfer serves one of the best roti canai here in Penang. The thick curries with the rich aromatic fragrant are truly unforgettable and customers always come back for more. There are different variations of curries available, chicken, beef and mutton. The meats are especially tender. Visitors should try all three gravies especially for the first timers. Assam Laksa is a signature food in Penang. 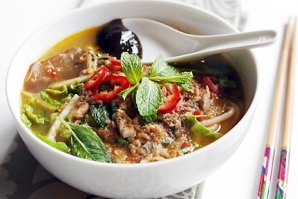 It is famous for its flavorful , sour and spicy soup base that serves together with noodles, shredded fish meats, finely sliced vegetables like cucumbers, onions, red chillies, pineapple, lettuce, mint leaves and torch ginger. Something that you must add on when trying the food is the sweet shrimp paste that comes together which gives an extra fragrant to the taste. Visitors can try one of the best Assam Laksa at Air Itam Asam Laksa at the Pasar Road, just beside the market. Mee Goreng means fried noodle. At Hameed Pata Mee Goreng food stall, they serve tasty Mee Goreng cooked with red sauce and spicy squid. The mouth-watering spicy squid is really tantalizing but for those of you, who cannot tolerate the spiciness, do get some cold drinks ready as you savor the dish. This food stall is located at the Padang Kota Lama Food Court at Jalan Padang Kota Lama next to Fort Cornwallis. Ais Tingkap or “Window Sherbet” in English is a special rose colored drink which shaved ice, sugar syrup that contains coconut flesh and basil seeds. Some other ingredients are like rose essence and mixture of Indian herbs. The drinks are very refreshing and it is a thirst quencher on a hot weather. Do stop by at Ais Tingkap at Lebuh Tamil, beside Chowrasta Market for a try on this yummy drink. Another great dessert is the Cendol. It is basically dessert that made from pandan flavored jelly noodles and added with coconut milk, palm sugar and red beans. This is a signature dessert and not to be missed whenever you visit Penang. You can have it at most of the places especially at Penang Road Teochew Cendol at Lebuh Keng Kwee. Char Kuey Teow is a popular dish in Penang. It is a dish of fried noodles with prawns, duck egg, Chinese sausage, beansprouts and cockle meats. The special aroma from the duck egg gives a rich flavor to the dish. Visitors must try this at Ah Leng Char Kuey Teow at Lorong Zoo 6, Air Itam. You can either order a normal plate with normal prawns or a special one that comes with 4-5 large mantis prawns. Fried Oyster or better known as “Oh Chien” in Hokkien is a scrumptious food in Penang. The oysters are fried with egg batter and chopped spring onions giving them a crispy texture on the outside but soft and chewy inside. One of the best Fried Oyster you can get is in Kedai Kopi Seng Thor located at Lebuh Carnarvon. Besides, Pei Pa Duck is a kind of duck dish deep fried and later on chopped and served with savory and sweet sauce with peanuts, shallots and garlic. The skin of the Pei Pa Duck is especially crispy and the meats are juicy, visitors must try this at Kedai Kopi Bee San located at Jalan Air Itam.